Intel Centrino laptops, especially those using the brand-new Core Duo processor, offer much to the PC-based musician but can suffer a reduction in their usually generous battery life under certain circumstances. We investigate. Intel's Centrino laptop design has proven incredibly popular with the PC Musician. Its Pentium-M CPU offers impressive processing power coupled with low power dissipation, allowing musicians to run lots of plug-ins and soft synths without the need for noisy cooling fans. In fact, coupled with low-noise hard drives, many Centrino laptops are almost silent during normal operation, and can provide battery life of three hours or more when running typical music applications. Intel released their first-generation Centrino Mobile Technology back in 2003 with the Pentium-M 'Banias' processor, which is what I have in my Centrino 1.4GHz laptop, bought from Millennium Music in December 2003 and still going strong. This CPU has a Level 2 cache of 1MB, runs on a 400MHz front-side buss (FSB) and was released with clock speeds from 1.3 to 1.7GHz. About a year later, Intel released the Dothan, which ran with an identical FSB but increased the L2 cache to 2MB and was available at clock speeds from 1.5 to 2.1GHz. In early 2005 Intel introduced the Sonoma, with a jump to a 533MHz FSB and clock speeds from 1.6 to 2.26GHz. That model is still used as the basis of most specialist music laptops. Coming soon to a laptop near you. Intel's new Core Duo processor range offers the increased capability of dual-core processing and even longer battery life, but may only achieve its full potential if the Windows XP USB 2.0 drivers are rewritten. The next big hope for the Centrino line is the Core Duo processor (code-named Yonah). The first laptop models using this latest technology started to trickle out from various manufacturers in January 2006. As its name suggests, the new processor is a dual-core model, already the saviour of many a desktop musician's PC, as it offers significantly faster performance than a single-core equivalent could manage (a Core Solo version with single CPU core is also available, but not likely to be as popular). The Core Duo processor has also been used by Apple in their Mac Book Pro laptop, which is said to be four times as powerful as the Power Book G4. The Core Duo processor features a 2MB Smart Cache that is dynamically sized, allocated according to the requirements of each core, and features 'Enhanced Deeper Sleep' and 'Dynamic Power Coordination'. Together, these features can place either or both cores into an idle state to save power, and they provide significantly greater processing muscle and even longer battery life. AMD are also poised to release a dual-core version of their mobile Turion CPU, based on the same architecture as their already popular Opteron and Athlon 64 ranges, but this isn't likely to be available until at least July 2006. However, if you're desperately waiting to buy a Core Duo PC laptop to make music now, be aware of an unfortunate bug that could considerably reduce its battery life if you plug in any USB device, and that probably affects all Centrino laptops, albeit not to the same extent. You probably won't notice the problem when running your laptop with a high CPU overhead (as you probably will with music applications), but it may become more obvious with more typical office-style activities. The bug was first noticed by the engineers at the Tom's Hardware web site when they were testing the battery life of an Asus Core Duo laptop that was in for review. Although this initially measured an excellent 4.5 hours, the laptop ran out of juice after just three hours once they had plugged in (but not accessed) an external USB 2.0 hard drive. A double-check with a Sonoma-based laptop also showed a drop, but this time it was considerably smaller (from three hours and six minutes to two hours and 51 minutes). In both cases, the current drain caused by having the drive connected was negligible, at about one Watt. After further investigation and discussions with Intel about this (apparently) Core Duo issue, eventually Microsoft acknowledged the problem, which is allegedly due to a Windows XP driver and has been known about for some time. All Centrino laptops have a set of 'sleep' states that I discussed in PC Notes December 2003. If various components aren't being used, they switch to one of these sleep states to reduce power consumption and therefore extend battery life. The Core Duo introduced an even deeper sleep mode designed to further increase battery life. 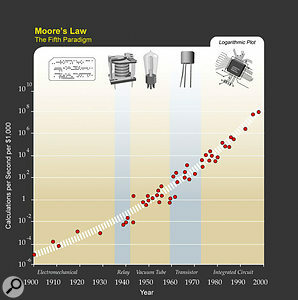 Still going strong after 40 years, Moore's Law predicts the increase in computing power over time. 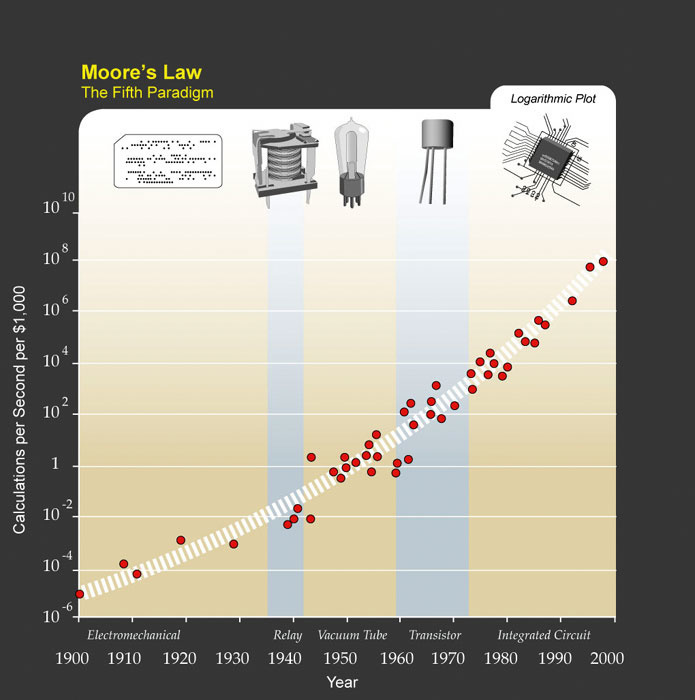 Ray Kurzweil's expansion of Moore's Law proves that this underlying trend holds true even when extended from integrated circuits back in time to discrete transistors. It seems that Windows XP SP2 installs a USB 2.0 driver that prevents the laptop from entering any of the three deepest sleep modes once a USB device is connected. What makes the problem worse is that the power drain is triggered as soon as you plug in a USB device (even a USB 1.1 mouse or a memory stick), even if you're not actively using it. Subsequent tests confirmed that the problem also occurs with USB motherboard devices, such as an integral USB 2.0 camera, even if this is disabled and without drivers, so anyone buying a Core Duo laptop with such a feature may never experience the long battery life that they should! Fortunately, there is an official but hitherto secret Microsoft registry tweak that can fix this fault on many (but not all) systems. It has been anonymously posted at http://it.slashdot.org/comments.pl?sid=175466&cid=14588517. However, if you ever put a Duo Core laptop into suspend mode the problem recurs as soon as you reactivate it, and is only cured by a reboot. The issue probably affects all Centrino laptops to some extent when they are in deeper sleep modes, but is more obvious on the latest Core Duo models because they are otherwise so clever at extending battery life. Since it's related to a Microsoft driver, the problem is unlikely to affect Apple's Mac Book Duo, even though the latter uses the Core Duo processor. Let's hope a proper fix is produced as a matter of urgency, now that this is out in the open. Several SOS PC Music forum users have recently complained of bizarre symptoms that have subsequently been traced to the same cause, so here they are to save anyone else having to pull their hair out. If your PC hangs during shut-down, with a blank screen and a frozen mouse pointer, ever displays a 'Cannot Find Enough Free Resources' error message, complains that there's a problem with its paging file, even though you know the page file is fine, or your floppy drive disappears from the list of drives in My Computer and Explorer, it might be due to Pace InterLok anti-piracy software. Apparently, its Tpkd.sys driver may use the same IRQ as the standard floppy-disk controller. Fortunately, the solution is easy enough: visit the Pace web site, at www.paceap.com, and download the latest version of the driver software. Lots of software companies now use iLok protection for their software, including Antares, Digdesign, Steinberg and Waves, while others, such as Arturia, Korg, Steinberg and Yellow Tools, use Syncrosoft's dongle protection (www.syncrosoft.com). The problem I've detailed above proves, once again, that making sure you keep your drivers up to date is becoming increasingly important. In fact, I now use the same technique that I do with a new audio interface: I completely ignore the supplied drivers on the CD-ROM and instead visit the manufacturer's web site to get the latest versions, which are nearly always at least one revision newer, and sometimes two or three. Installing the very latest version of dongle drivers is especially important. Although the dongle drivers supplied with one plug-in may work well with that product, there's no guarantee that that particular driver revision won't create problems with another product that you already have installed on your hard drive, from a different company, that accesses the same dongle. As I write this in mid-February, Syncrosoft's License Control Center (sic) software is now up to version 5.0.0.1 for all Windows and Mac OS versions, while Pace's iLok is up to version 5.2 for both platforms. There's now a special web site for iLok users, at www.ilok.com, described in more detail by Mike Thornton in his feature on Managing iLok Plug-in Licenses in the November 2005 Pro Tools Notes. Nanotechnology is the understanding and control of matter at dimensions of roughly 1-100 nanometres. To give you some idea of how tiny this is, one nanometre is roughly the length of a sucrose molecule, and 2nm is the diameter of the DNA helix. However, far from being the stuff of science fiction, nanotechnology has a place in real life: Intel's Core chips, for example, are fabricated using 65nm technology. Back in April 1965, Intel's co-founder Gordon Moore made the prediction that the number of transistors on a chip would roughly double every two years, and this prediction still held largely true on its 40th Anniversary last year, although Moore stated then that his law might not apply for much longer, since transistors are beginning to approach the limits of miniaturisation. However, IBM researchers now believe that Moore's Law will be valid for about another seven years, because of a new technique called DUV (Deep Ultra-Violet) optical lithography, which can print circuitry only 30nm wide. Beyond this limit, it's expected that new methods will need to be used for further miniaturisation, and these are likely to prove expensive. Interestingly, Ray Kurzweil (of synth fame) proposed a generalisation of Moore's Law back in 2001 to extend it to other technologies, and you can see in the screenshot that this holds true for five generations of computer technology. Socket M2 Motherboard Arrives: The first motherboard featuring AMD's 940-pin Socket M2 (which I first mentioned in PC Musician in the March issue of SOS) has just surfaced, courtesy of MSI, with their K9N Platinum model. It features a new high-end Nvidia chip set based on the Nforce4, supports the SLI (Scalable Link Interface) method of connecting two graphics card together and running them as one, and has six SATA drives, four DDR2 RAM slots, two PCIe 16x slots, two PCIe x4 slots and two standard PCI slots. Here's hoping that the new Nforce4 chip set will finally solve the problems that have beset musicians trying to run legacy PCI soundcards. PSU Power Calculator Improved: Back in PC Notes May 2004, I recommended an on-line PSU wattage calculator, courtesy of the JS Custom PCs web site (www.jscustompcs.com/power_supply/). Well, it's been considerably improved since then, with separate pages for AMD, Intel and server systems, plus lots of newer component choices, although no dual-core or PCI Express options had appeared at the time of writing. Nevertheless, this calculator is still a very useful tool if you're about to build a new PC and need to know the likely capacity of its power supply. Mutual Support For Aardvark Users: It's not only sad when a company goes out of business, but also worrying for existing customers who may need future tech support. So I was pleased to discover the Aardvark Support Group (http://invisible-bridges.com/asg/index.html), run by an Aardvark customer as a resource. It's still in an embryonic state, but already provides downloads of all the final driver versions for the various Aardvark products, plus PDF manuals and a short Q&A page.